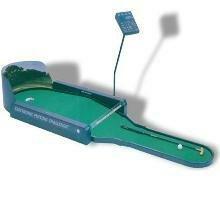 This electronic putting challenge is the ultimate golf game for up to 4 players. Putting challenge is ideal for exhibition stands, promotions, conferences and events. The motorised undulating green provides 72 different hole combinations and the computer control panel allows single, 9 and 18 hole formats. 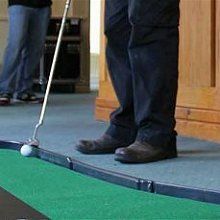 The putting challenge features built-in sensors which track the ball and the computer total’s each player’s score after each hole. The system has a built in speech system and a hole in 1 is rewarded with applause.